Where neighbors create legacies. The Community Foundation provides unique opportunities for individuals to create a legacy during their life and afterward. Leaving a gift through an estate plan, such as in a will or through life insurance, can have a permanent effect on the causes and organizations that matter most. This year, Nancy Smith established the Nancy J. Smith Fund, a field of interest fund that supports two causes close to her heart - the elderly and animals. The fund will be available to make small grants during Nancy’s life. A gift from her estate plan will grow the fund allowing it to make a greater impact on these causes forever. A legacy gift requires a trust and commitment from us and from our donors. It is our promise that we will protect your charitable assets and use them as designated. Members of our Legacy Society have informed us of their planned gift. Listed below are the people who have made a promise to us. You can make that promise, too. Contact Kelly K. Shrock, president, at 765-747-7181. 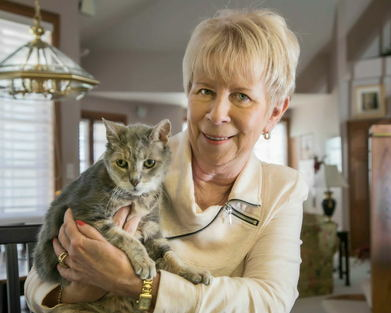 Legacy Society member, Nancy Smith poses with her cat Lambchop. Nancy has worked with the Foundation to establish a fund through her estate that will support two causes that matter most to her – services for the elderly and for animals.